TO DIE FOR | Dolls Kills X Searching For A New Jacket! As you guys have maybe seen in my photos, I've been wearing the exact same pleather jacket + vest combo for YEARS now, at least since 2013 or before that. And all the time I think "It's time for a change!" but I have yet to purchase another jacket that I know I'll love as much as the one I have now. Well, I am finally on the hunt for real this time and I took to the website Dolls Kill because I figured that I'd definitely find something that I will fall in love with, and I wasn't wrong! There are so many options on there so I figured I would show you all some and maybe it will help me narrow down my choices and decide on one.. or two..? This one here is the Roses Motto Jacket by Sugarpills for $147.86 CAD and it's something that I am absolutely in love with but don't think that it would be good for a daily jacket because I mostly wear black and it doesn't have as much coverage as I'd like but damn! If I wore more pink and fun outfits I'd have bought this in a second! This is the Katakana Coaches Jacket by Perspective Globals for $107.54 CAD and this is a definitely a main contender. I am all about the black and white graphics and Japanese lettering, it's probably one of my favourite styles. 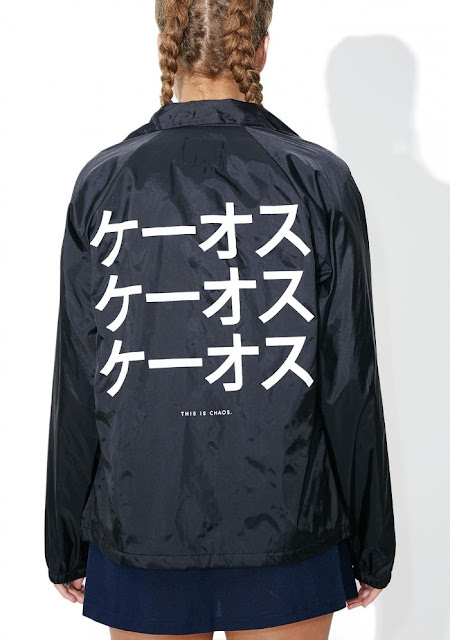 It says CHAOS in the Katakana lettering and it also has it smaller on the front, since I'm really into the Japanese car scene I think this would be perfect and could easily be styled with a lot of my wardrobe! This is the Blush Bomber Jacket by Members Only for $131.73 CAD and this is also a main contender because I am obsessed with this colour but it would also clash with my Kate Spade bag that I always use because it's basically the same colour but maybe a little more tan but I don't think it would be a big issue! I could definitely rock this was a lot of things and it's casual enough to just throw on but you can also dress it up which is important to me. This is Huntress Hooded Knit Jacket by Dolls Kill for $80.65 CAD I'd assume, it doesn't specify a brand where it usually does. I think this would be so perfect because it looks big and comfy and it's long enough that it would be warm. It's so casual and chic and the hood is to die for! This one isn't in my size, but I think I could settle for a medium. There were also a few others I was fawning over but they were in the sale section and didn't have my size, pretty sad about that but that's okay! I really wanted the Valfre X Dolls Kill Anti Everything Jacket but all they had left was large which I think would be too big on me. 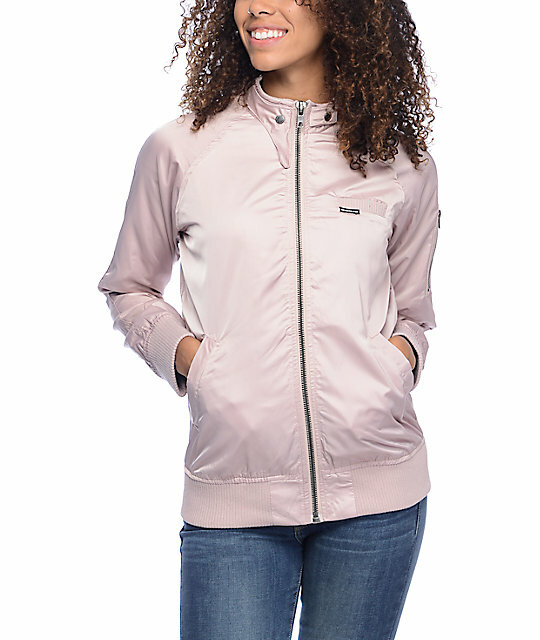 I think that since I need a new black jacket I'll go with the Katana Coaches one but I also really want the Blush Bomber jacket but also the Huntress jacket is so chic. Ugh! Such hard decisions! Eventually I'll make one but I wanted to share some of my choices with you all. Which jacket do you think I should choose?